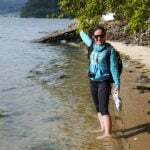 Home / Blog / Advice & Travel Tips / What is the best footwear for the Camino? What is the best footwear for the Camino? Taking care of your feet is one of the most important steps in preparing for your Camino adventure. Having the best footwear for the Camino de Santiago or any other long distance trail you are planning will help you to stay comfortable and enjoy the journey! When you are choosing the best footwear to buy for your trip you should buy a reputable pair of shoes or boots. You don’t want to be halfway through your trip when your shoes start to fall apart. To ensure that you are comfortable on your walk there are a few things that you should keep in mind. Firstly, what distance do you plan to travel each day? If you are walking sections of the Camino you will walk on average between 15 – 25 kms per day, depending on the route that you choose. Also, you need to check the breathability of the walking shoes or boots. You want to make sure that your feet feel secure but also have room to breathe. Hiking boots can sometimes be heavy and cause blisters if they are not well worn in. A good pair of walking shoes will suffice if you are planning on walking one section of the Camino. Before you purchase new walking shoes check that the footwear is lightweight and flexible. Secondly, what type of terrain will you be walking across? 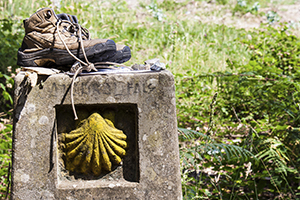 Depending on the time of year, the weather on the various Camino routes can affect the level of difficulty when walking. We don’t want you to get stuck in the mud so remember to check the weather prior to your trip and buy the walking shoes most suitable for the trails. If you are going in the peak of summertime bulky hiking boots may be too hot so we would recommend a good pair of walking shoes instead. Good quality walking shoes or low cut boots will provide the breathability you need and these are suitable for well maintained trails along the Camino. Hiking boots that come up over the ankles are great for protection when you are carrying a heavier load or if you plan to walk across a lot of uneven terrain. With our luggage transfers you won’t need to carry your large backpack with you each day so the bulkier boots might not be necessary. If you are hiking near wet or mountainous areas you will need your shoes or boots to be waterproof. Thirdly, socks make a big difference! Merino wool is the recommended wool for long distance walkers and hikers. Although this material can sometimes When you are packing for the Camino, make sure to pack extra pairs of socks for each day. This will help you to keep your feet dry and comfortable for the journey. Last but not least be sure that your walking shoes or boots are the right fit. Don’t leave it until the last minute to buy your boots. You will need to try them out and test them on preparation walks. A well fitted boot should hold your feet feel firmly in place and you should be able to wiggle your toes. Stretching the boots to mould around your feet is a good idea if you plan on walking long distance for a week or over. Most reputable outdoor clothing shops will be very familiar with hiking boots, walking shoes and the various products available to keep your feet in good condition when you are planning for the Camino. Drop into a local store, try on a few different pairs and don’t be afraid to ask for their advice. To finish with, don’t forget to bring a pair of sandals or flipflops for the evening times to allow your feet to breathe and to give your feet a welcome break from the trekking each day. We hope that this information is helpful. If you wish to book your next Camino de Santiago walking or cycling tour please contact one of our travel specialists. Good Morning Mayra, thank you for your comment. A good pair of walking shoes from a reputable outdoor gear store will be good for the French Way. With shoes, it is important that you wear them in by doing a few preparation walks. Don’t wear brand new shoes as these will start to hurt your feet after a few days and could lead to blisters. Merino wool socks are also a worthwhile purchase for your walk. These will help to protect against blisters and give you comfort during the day. Hiking boots are a good purchase if you are doing a full route as and any route with lots of hills but if you are doing a week they aren’t a necessity. I hope that this helps and you enjoy your adventure. Kind wishes, Lisa from CaminoWays. I’ve read mixed reviews on what type of shoes to wear depending on the time and route you walk. What do you suggest for The French Way during the last week of May? And do you think custom Insoles are necessary? We will be walking an average of 10 miles a day. Hi, am doing the St. Frances Camino in May, Assisi to Rome. Do you think I need hi-top hiking boots or hiking shoes? As a long distance walker I have always struggled with blisters. Certainly, they plagued me on the Camino. But, I finally found the PERFECT shoes: Hoka One One Tor Summit boots are like a dream. They’re super lightweight, cushy, and relatively waterproof. Since getting these and custom orthotics, my walking life has completely changed for the better. Hi Peggy, great news about your upcoming trip. The Portuguese Coastal route is simply fantastic at that time of the year. If you click on ‘itinerary’ on this link: http://caminoways.com/ways/portuguese-coastal-way-caminho-da-costa/portuguese-coastal-way-full-walk you’ll be able to see the elevation for the trail. Because it follows the coastline, the terrain is quite easy and there is no dramatic elevation. I hope this helps! Our walking notes are currently being updated for that particular route so you should be getting the most up to date information with your holiday pack. Let us know if you need any additional information. Some fantastic coastal towns along the way such as Viana do Castelo, Baiona… and of course Porto is simply wonderful. Hi Frances, thank you for your comment. The French Way route, particularly the last section from Sarria into Santiago is probably the most accessible for a scooter. Let us know if you need any additional information. Kind regards. is there a section of the Camino which is accessible to someone on a mobility scooter? Hello, we will be walking the Camino Portuguese with you in June. Can you give us an idea of the terrain on that particular route?